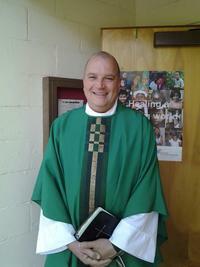 The Rector of Epiphany Episcopal Church is The Rev. Mack Olson. His partner is Jeremy Karagan, and they have boxer dogs named Truman & Wilmer and a orange tabby cat named Dan. Fr. Mack has a Bachelor of Arts from the University of Colorado, Boulder and a Master of Divinity from the Iliff School of Theology in Denver, Colorado. Prior to his call to ordained ministry, Fr. Mack worked for nearly 20 years in higher education, first at the University of Colorado, and most recently at Sonoma State University as the Director of Judicial Affairs. After joining St. John 's Episcopal Church in Petaluma in 2007, Fr. Mack started the discernment process for Holy Orders, and was ordained as a Deacon on September 10th, 2011, and to the Priesthood on March 24th, 2012. Before coming to Epiphany, Fr. Mack worked as a hospital chaplain for two and half years at John Muir Health in Concord, California. Fr. Mack looks forward to getting to know everyone at Epiphany, and he looks forward to discerning together God's call to us to love and serve each other and the wider community of Vacaville.